Same blocks, just a lot more of them!! This is as big as I’m going. Seven blocks by 9 rows, the bottom two rows are on the machine getting stitched together. 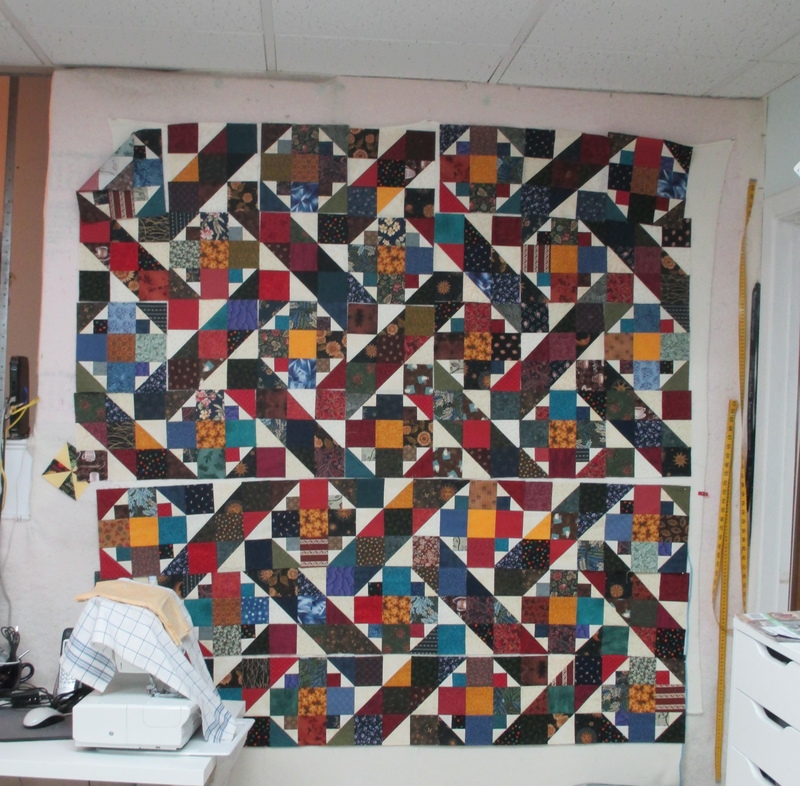 It gets a pieced row to finish the pattern, then a border to keep all of chaos contained. I have used up almost all of my 3 1/2 inch strips…and there were some pretty ugly old prints among them. This is from Gale Bongs book “S is for Scraps”….I love the pattern just not really excited about my scraps. Take a break and go check out more designs at Judy’s. I think the problem is with alot of our scraps is that some of them have been hanging on a good while and fabric from back when tended to be more toned down then most fabric from now. We are used to an adreneline rush from pure color.. But the stuff and ways it comes together in this quilt will keep you going back , and then back again, looking at how the pieces interact together and why you did what you did. That is a lot of interest for your money! I love the way the two blocks keep your eyes moving around the quilt. I love it too, especially all the red! Thanks for giving me some credit, too.